Goldman Sachs just went bullish on the commodity sector for the first time in four years. Metal mining companies and steel stocks surged Tuesday after analysts at investment bank Goldman Sachs turned bullish on the sector. 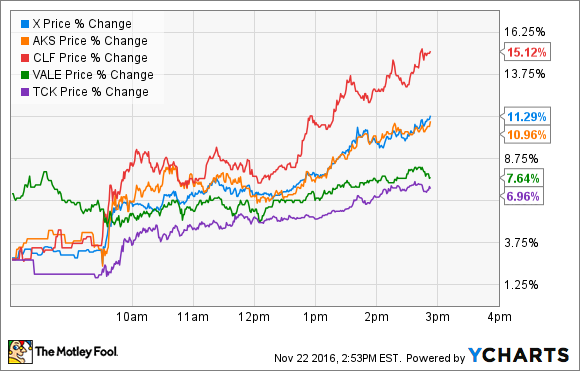 Leading the way were U.S. Steel (NYSE:X), AK Steel (NYSE:AKS), Cliffs Natural Resources (NYSE:CLF), Teck Resources (NYSE:TECK), and Vale (NYSE:VALE). Goldman Sachs recommended that investors overweight their portfolio to metals and mining companies as well as steel producers in a bet on higher commodity prices. Driving that view is the expectation that manufacturing is expected to pick up around the world. One of the drivers is the proposed infrastructure plan of President-elect Donald Trump, who recently released a video stating that he wanted to increase the country's steel production capacity. These factors have the bank taking its first bullish stance on the sector in more than four years. Further, it raised its iron ore forecast, citing unexpectedly resilient steel usage and increased demand as customers restock steel inventories. That outlook bodes well for producers U.S. Steel and AK Steel, because it suggests that demand could continue to remain healthy, which should lift prices. In fact, steel prices in China are red hot and recently hit the daily trading limit. That is noteworthy because higher steel prices in China could stop that country's producers from dumping cheap steel in the U.S., which has hurt the profits of U.S. Steel and AK Steel in the recent past. Further, rising steel demand should continue to lift the prices of steelmaking materials like coking coal and iron ore, which would benefit miners like Cliffs Natural Resources, Teck Resources, and Vale. In fact, iron ore prices, like steel, hit the daily trading limit in China Monday due to high demand. That said, iron ore prices have recently dipped due to inventory concerns in China, though that decline was off of a 33-month high earlier in the week. Meanwhile, coking coal recently touched a five-year high, which is causing some mine operators to think about reopening shuttered mines. After several tough years, optimism in the metals sector is growing. Not only is global manufacturing improving, especially in places like China, the U.S., and Europe, but it could get even better if Trump pushes through his infrastructure plan. That improvement could keep metal prices rising, which would translate into higher profits for producers.